An audio recording has emerged of the abducted school girl, Leah Sharibu, calling on the Nigerian presidency to facilitate her release. In the 35-second recording secured by a Nigerian news agency, Ms Sharibu asks “the government and people of goodwill to intervene” to end her plight. Speaking in Hausa, she urges “members of the public” to assist her parents, younger brother and relatives, and concludes with a plea for compassion: “I am calling on the government and particularly the president to have pity on me and get me out of this serious situation. Thank you”. Ms Sharibu’s family confirmed to CSW Nigeria that the voice on the tape is hers. The 15 year-old was the only Christian among 110 school girls who were abducted by the al Barnawi faction of Boko Haram from their school in Dapchi in Yobe state, north east Nigeria, in February 2018. Following negotiations, the other surviving students were released on 21 March, but Ms Sharibu was held in captivity for refusing to convert in exchange for freedom. The emergence of the audio and a new photograph of the schoolgirl sitting on a mat in a peach-coloured hijab have given rise to speculation that renewed negotiations for her release may soon be underway. In July, Aisha Wakil, who is also known as Mama Boko Haram due to her contacts with the sect, confirmed that Ms Sharibu had still not converted, adding that her anti-human trafficking non-governmental organisation (NGO), Complete Care and Aid Foundation, was working with the International Committee of the Red Cross (ICRC) to secure her freedom. In its 22nd report to the United Nations Security Council on 27 July, the Analytical Support and Sanctions Monitoring Team stated that the other Dapchi girls had been released “in exchange for a large ransom payment”, citing “Member State information” as its source. However, the Nigerian Minister of Information and Culture continued to insist that no ransom was paid for their release. 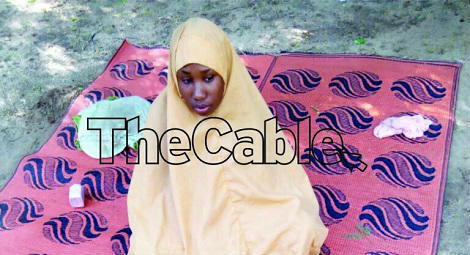 Ms Sharibu's situation has garnered worldwide attention, sparking protests and petitions on her behalf. CSW’s 200 Hours for 200 Days protest, drawing attention to her plight and amplifying calls for the Nigerian government to negotiate her freedom, will take place between 4 September and 12 September. Protesters will take turns standing behind a symbolic solitary school desk in front of the Nigerian High Commission in London and take part in a social media campaign with @CSW_UK to #freeleah. The al Barnawi faction of Boko Haram is also holding three female health workers who were abducted during an attack in Rann, Borno state, in which two humanitarian workers from the International Organisation for Migration (IOM), one from the ICRC and another from UNICEF, were murdered. Alice Loksha Ngaddah, a nurse and mother of two, and midwives Hauwa Mohammed Liman and Saifura Husseini Ahmed, have been held since 1 March. Furthermore, 112 of the girls abducted from their school in Chibok, Borno state by the terrorist faction led by Abubakar Shekau in April 2014 are still unaccounted for.